Selecting an event venue is much like choosing what to wear to a party. Unless you have that killer outfit selected - your accessories can only do so much and often without the proper attire - your accessories begs the question - Overcompensation Much? Selecting the proper event venue sets the tone for rest of the planning process - the theme, the decor, the food/catering, events and celebration. As this process can be overwhelming we thought we would share some tips to help with the anxiety and help ease the process because hospitality is what we do best. Guests - Life Of The Party. Who & How Many? Deciding on whom to invite (and whom to skip) can be a trying process. Friendships, peer pressure and need to please everybody can often be a force too strong. We suggest nailing down a quick list and keeping a buffer of 10% of the quick list from the top of your head as your final guest list. If you didn't think of them while making the quick list - do you really want them around? This helps you choose between small/medium/large sized venues. 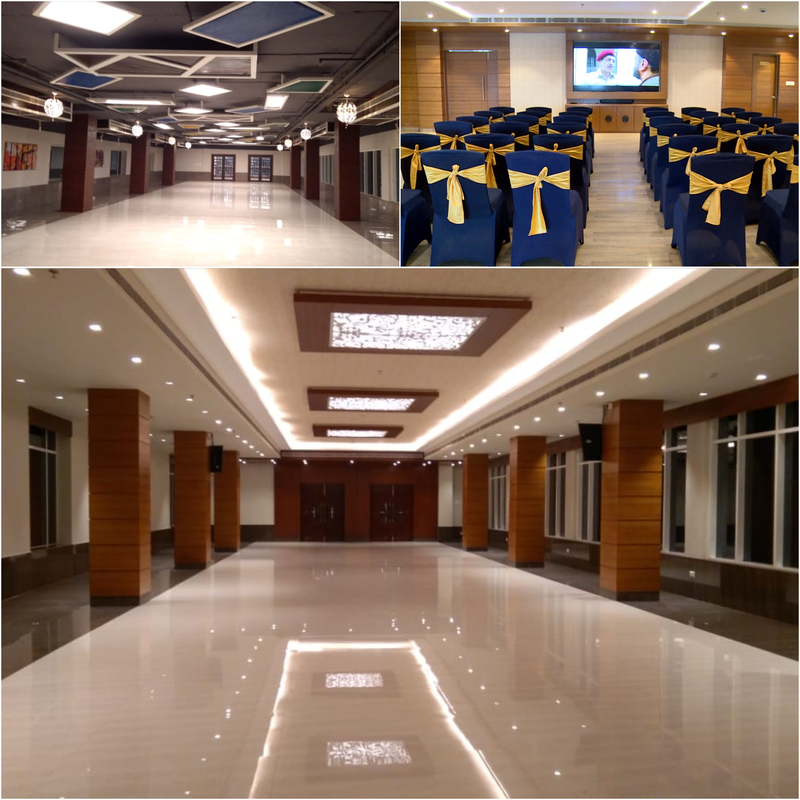 Sankalp Media & Convention offers 3 banquet halls that can accommodate from as little as 50 people to upto 800 people in a single banquet hall. And if you intend to invite the whole city - well all 3 banuqet halls combined can easily accommodate upto 1500 guests. Check out our individual banquet halls in our Gallery. Location of the venue, how well is it connected to the city and convenience of finding, getting there and parking are some of the constraints one should be aware of from the get go. You don't want your best friend missing your party because they had to travel 1.5 hours to middle of nowhere because oops you didn't think about location constraints. Sankalp Media & Convention is located very close to Infocity Square on the Tech Corridor Main Road. With an easy to spot impeccable building with our name on it and right in front of Sai Temple (because every auspicious occasion deserves the blessing of the almighty) you wouldn't have to worry about location constraints. It is well connected with the city via Public Bus #225 & # 306 and auto-rickshaws. If you decide to drive, we offer complimentary free parking on premise for you and your guests to save you the hassle of find a parking road-side. Considering traffic is light, it's just 6 min walk to Infocity Square, 5 mins by Car to Patia Chowk, 12 mins to Nandankanan, 15 min by Car to Saheed Nagar, 20 mins by Car to IRC Village, 25 mins by Car to Old Town. Wherever you live in Bhubaneswar you are less than 30 mins away from the perfect banquet hall for your event. Weather - Outdoors or Indoors? Picking the location has lots to do with the weather. Choosing an outdoor venue when rains are expected can well lead to ... a drenched situation (and not the fun-kind). If it's indoors and you pick a non-airconditioned hall when Surya Dev (Sun God) seems to be having a hay day can again lead to a drenched situation - and no body wants to smell like they came straight from gym in their party clothes. Sankalp Media & Convention offers only indoors venue, fully air-conditioned with exquisite decor so rain-or-shine the party isn't going to stop. Have you ever felt like stuck in the 70's while trying rock that millenial mohawk? We feel that way when we see some of the older banquet halls. Old, Basic and Bland - thats not our leftovers in the refrigerator - thats the banquet hall you could be making the mistake of renting. 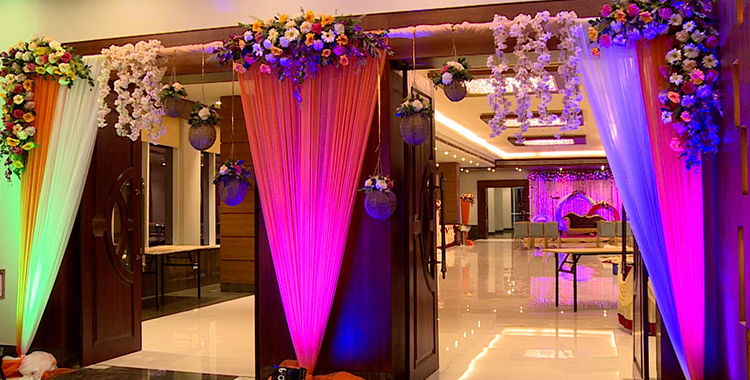 Our banquet halls' modern, eclectic and exuberant ambience will immediately make you fall in love with it. 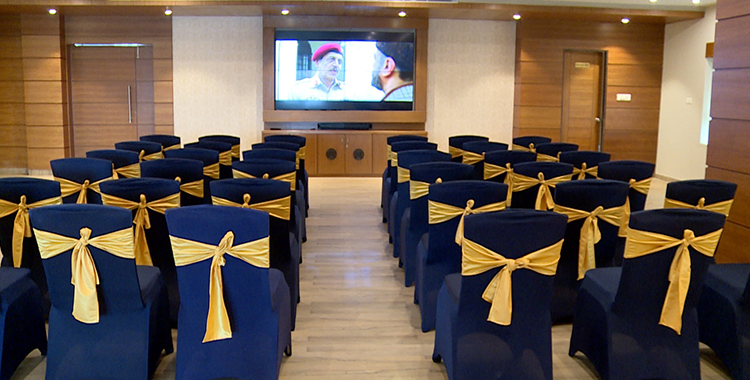 Our tastefully designed interiors and on-target modern decor complements our belief in the digital age - with Music & PA System, LED Display Screens and Premium Video Wall - you are all set to dazzle your guests and maybe play that carefully curated video/slideshow for the special ones. Your friends, family and well-wishers could not be any happier on your decision to rent our event space. We suggest taking a tour of our facility to experience what you just read. Deciding on whether you are planning an Ambani style multi-million dollar international event or a close intimate gathering of loved ones is imperative. We believe luxury doesn't necessarily need to come with a heavy price. Deciding on the budget early on will help you keep your costs in control as well as appropriate money towards different parts of the planning. You don't want to spend every rupee on decor only to leave your guests hungry because you forgot to order food. A quick back of the envelope budgeting for various heads like venue fees, decor, catering, gifts, clothes and miscellaneous will save you heartburn in the long-run. It's also important to pick a venue carefully in this regards. Do you want to rent a cheap dilapidated venue and spend a lot on decor or do you want to rent a tastefully decorated venue with minimal decor overheads? Do you want to rent a venue where you feel like you got a great deal but force you to use their caterers and realize later they just ripped you off by overcharging you for below-standard meal? Don't you hate it when sales people try upselling you for products you don't need or try selling you services with hidden fees and fine-print loopholes? We hate it too! One of the great things about dealing with us is - our transparency in dealing with our clients. We will be upfront with you regarding costs, fees and charges so you can make an informed decision. No haggling or spamming or incessant calls to get your business because we believe in graceful hospitality and your satisfaction is what we are striving for. 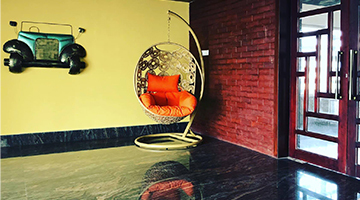 Sankalp Media & Convention not only offers well designed luxurious exteriors and interiors, it allows you to pick and choose your own decorators as it fits your budget. Our clients often comment how less they had to spend on decoration because the banquet halls were already so well decorated. We also allow external caterers of your choice. 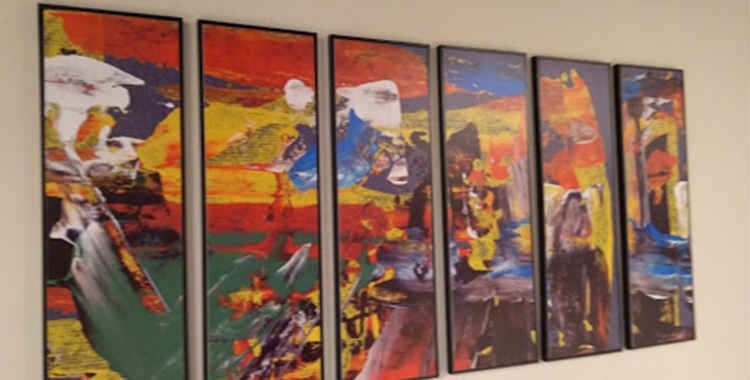 We would be happy to suggest a list of decorators and caterers who have successfully implemented events for our previous clients and let you choose. Restrictions - Questions you should definitely ask! It's easy to forget some of the basic restrictions while planning an event. So we compiled a list of these for your convenience. Treat this as your checklist but don't limit yourself to only these. Alcohol - Do you permit? Do you serve? Firecrackers - Do you allow those? Fire Risks? Mitigation? Timings - Noise? Going overtime? Security - What happens when ...? Sankalp Media & Convention has a few restrictions which can often be relaxed and worked around depending on client needs. We suggest you reach out to us early so we can work out a plan to ensure your event has all the facilities you desire. We can't promise the stars and moon but we can definitely promise trying hard to get you those because your satisfaction is what we are striving for. Amenities you might need but you didn't think of them yet. Have you ever booked a 5th floor banquet hall only to realize, the building doesn't have an elevator? Basic oversight can often lead to anguish. Let us help you with some pointers. BONUS TIP: Start early. The earlier you start planning the better you can. With the luxury of time you can evaluate more options, think those over and make an informed decision. Also, booking early gets you a better deal because remember "Early Bird Gets The Prey"